Cash-rich Dubai police has added Aston Martin, Bentley and Mercedes to its existing fleet of luxurious supercars which includes Ferrari and Lamborghini, making it the most stylish security force in the world. Following recent unveilings of a Ferrari FF and a Lamborghini, the force has shown off new cars from luxury UK auto maker Aston Martin, Bentley and Mercedes. 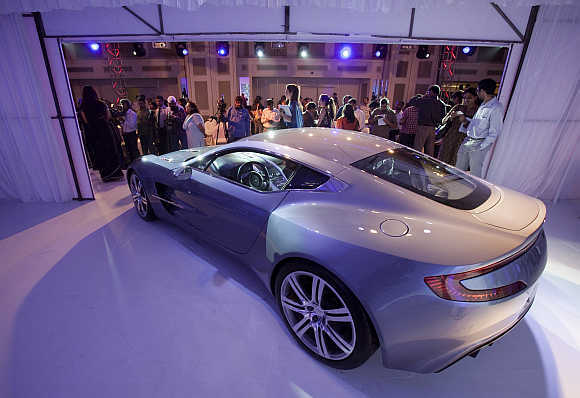 The Aston Martin One-77, Bentley Continental GT and Mercedes SLS have been launched at the Arabian Travel Market, ArabianBusiness reported. Last month, Dubai's police chief said that a number of Ferraris to be introduced to the force will be driven by female officers. 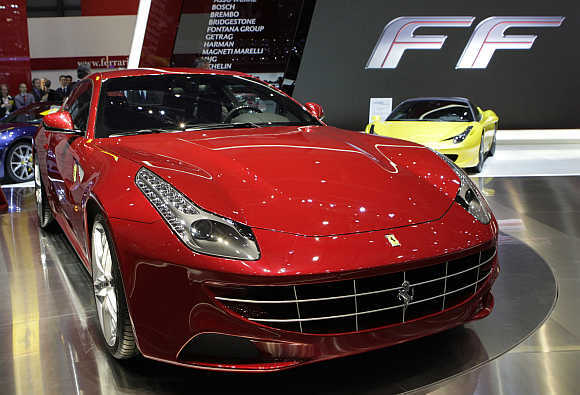 Commander-in-Chief of Dubai Police Lieutenant General Dahi Khalfan had tweeted that he expected to see Dubai Police's female recruits getting behind the wheels of the Ferrari FF supercar, which costs about $500,000 and has a top speed of 335 kmph. Last month, the department made the announcement via Twitter, "Ferrari joins # Dubai Police patrol fleet," the police tweeted. The twitter page also had an online link to the picture of the car. 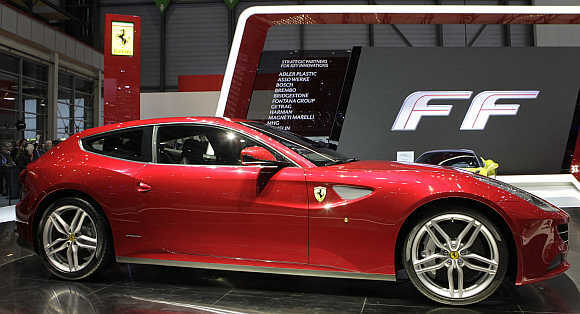 "Ferrari cars will be equipped with the latest technology needed by the police to control road movement and ensure safety and security on Dubai roads," Lt-General Khalfan had said. 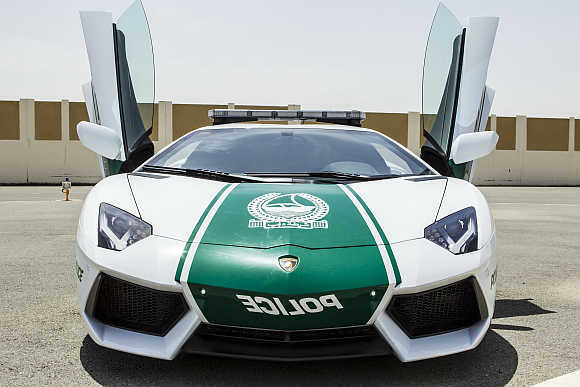 Earlier, Dubai Police also revealed its new AED2m ($500,000) Lamborghini which can reach speeds of up to 350 kmph. Dubai Police's fleet also includes the Toyota Land Cruiser and the Kia Mohave. Meanwhile, an environment-friendly car from S S Lootah has also been introduced to the Dubai Police fleet as it will improve safety works. Lt-Gen Khalfan said the new vehicle would help support the polices' efforts in preserving the security of the UAE residents and will provide fast service when required, especially at events when early intervention and protection of life and properties is needed. 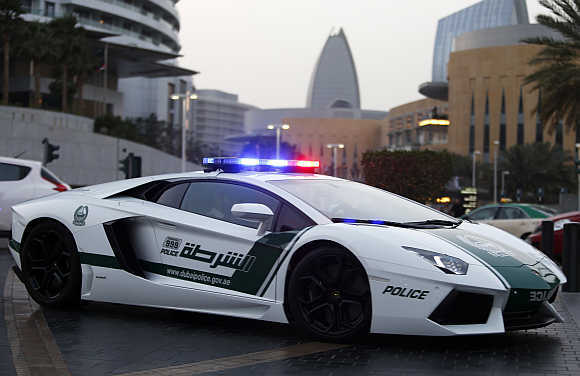 Let's have a look at some amazing cars Dubai police is driving these days. 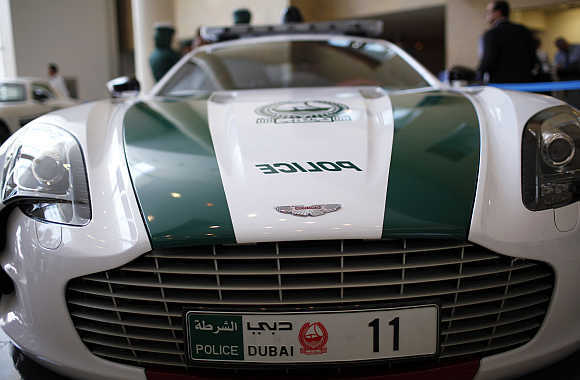 Image: An Aston Martin used by Dubai police. Lamborghini Aventador is a two-door, two-seater sports car. 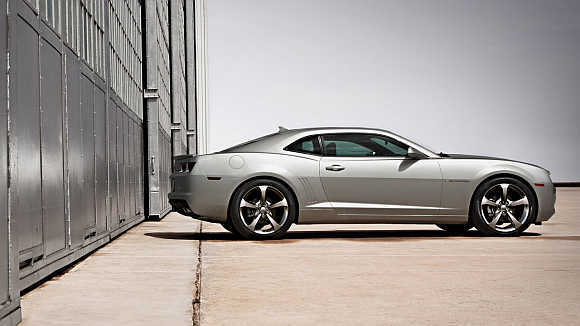 It was launched at the Geneva Motor Show on February 28, 2011, according to Wikipedia. Image: Lamborghini Aventador used by Dubai police. The car is powered by Lamborghini's 700 PS (510 kW; 690 bhp) 6.5 litre 60° V12 engine weighing 235kg. Image: Lamborghini Aventador patrols Dubai's streets. Aventador is among the fastest street-legal cars in the world and can touch a top speed of up to 350 km per hour. 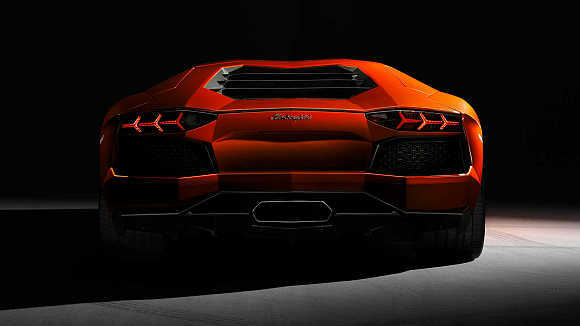 Image: A view of Lamborghini Aventador. The Aventador uses the same carbon materials that are used in the Boeing 787 Dreamliner. 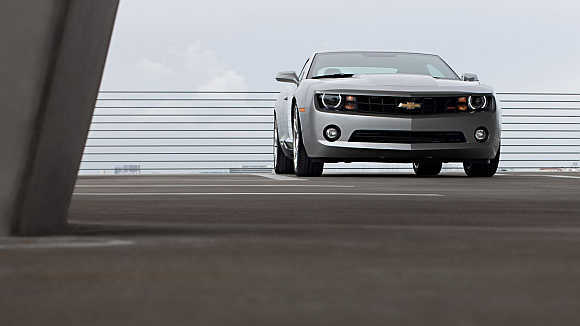 Chevy Camaro SS's 6.2-litre V8 engine produces 426 horsepower. 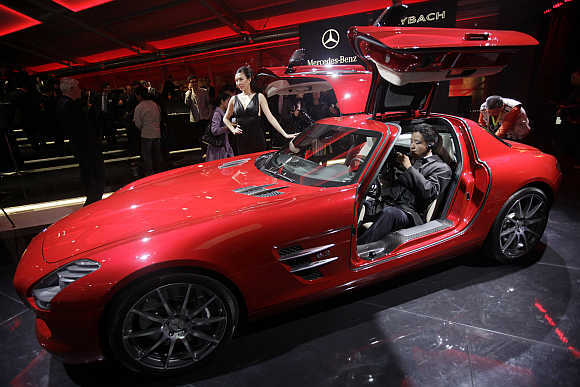 The Mercedes-Benz SLS is powered by a 6.2 litre engine and it can go up to a maximum speed of 317 km per hour. 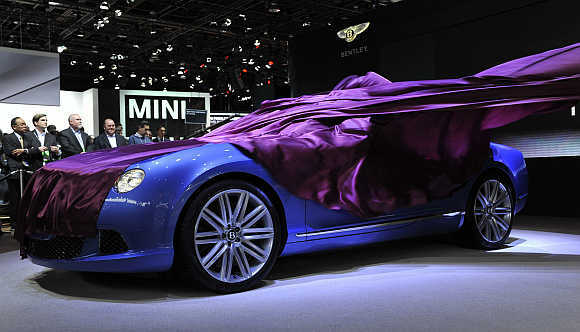 It is a front-engine, 2-seat luxury grand tourer automobile. 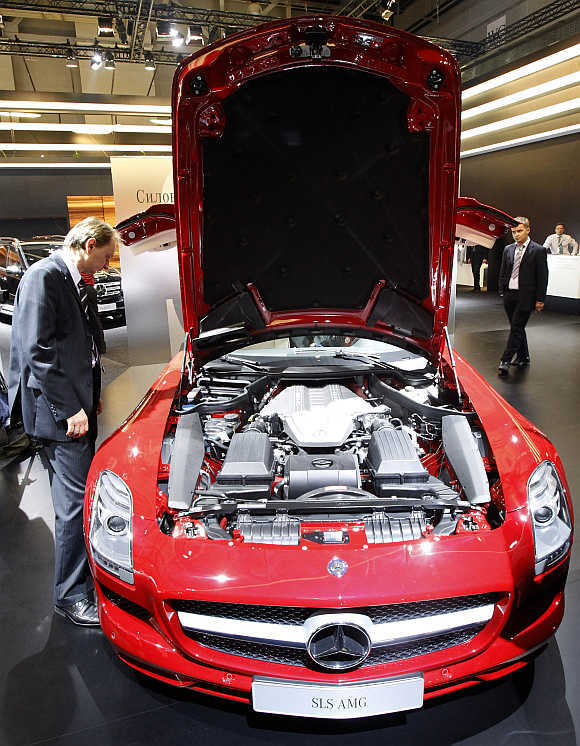 It is the first Mercedes-Benz automobile designed in-house by the German company. SLS stands for Sport Light Super and is assembled in Sindelfingen, Germany. 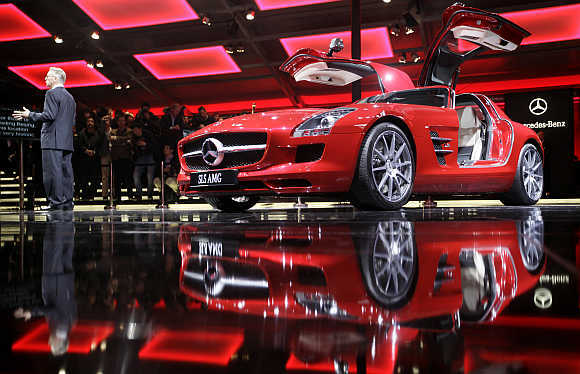 Image: A Mercedes-Benz SLS AMG is on display at the Moscow Auto Salon. It has a powerful 6.3 litre V8 cylinder Mercedes-AMG powertrain that is designed to pump out 420 kW/571 hp at 6800 rpm and top torque of 650 Nm at 4750 rpm. Image: The inside of a Mercedes car used by Dubai police. Ferrari FF is a four-wheel drive four-seater with a mid-front V12 that is the most powerful and versatile car Ferrari has ever built. 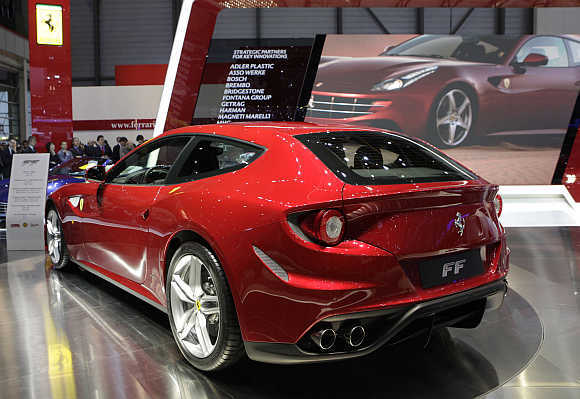 Image: Ferrari's FF is displayed at the Geneva Car Show in Switzerland. The revolutionary FF offers a completely new take on the sporting Grand Tourer theme. It is not only the first Ferrari with four-wheel drive, but, more significantly, a model that hails a major break with the past, effortlessly melding extreme sports car performance with the versatility and usability of a genuine GT and boasting an extremely innovative design. Every single area of the FF brims with innovation, not least its engine, the first GDI V12 to be coupled with the seven-speed F1 dual-clutch gearbox. The V12 unleashes a massive 660 CV at 8,000 rpm, and maximum torque of 683 Nm at 6,000 rpm with 500 Nm already available at just 1,000 rpm. The BMW 5 Series Gran Turismo is defi ned as much by its fascinating and ground-breaking design as by its technological prowess. Its innovative technologies go far beyond their individual components. 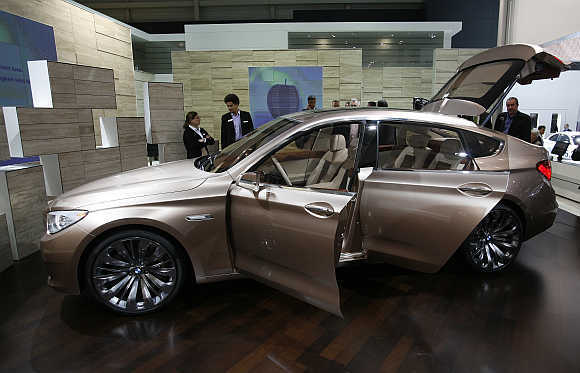 Image: BMW 5 Series Gran Turismo is displayed at the Geneva Car Show in Switzerland. 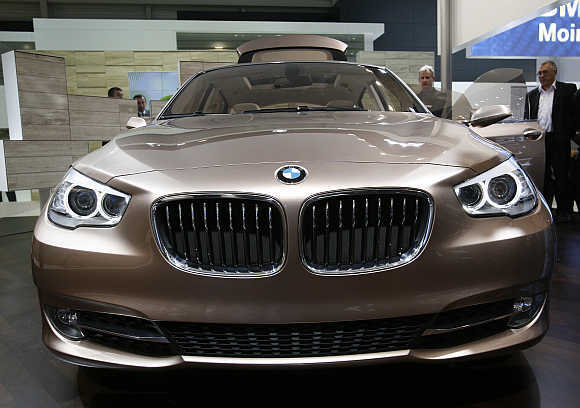 It features two holistic technology packages: BMW EfficientDynamics, which combines the preservation of resources with dynamic driving, as well as BMW ConnectedDrive, for optimum integration between the driver, vehicle and the world outside. 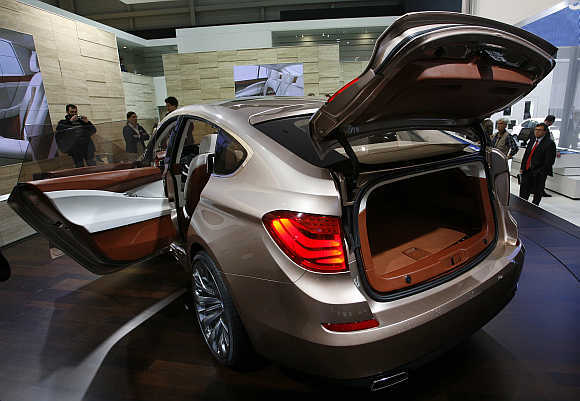 Image: BMW 5 Series Gran Turismo. The BMW 5 Series Gran Turismo handles every challenge with astonishing versatility. Take, for example, the standard, two-piece automatic tailgate, which opens and closes at the touch of a button. Smaller items can be quickly and comfortably loaded using a separate lid below the rear window. The advantage: passengers remain protected from cold and wind thanks to the variable separating panel and the secure luggage compartment cover. The 6-litre, twin-turbocharged 12-cylinder engine that powers the Continental GT caused a sensation when first revealed in 2003. 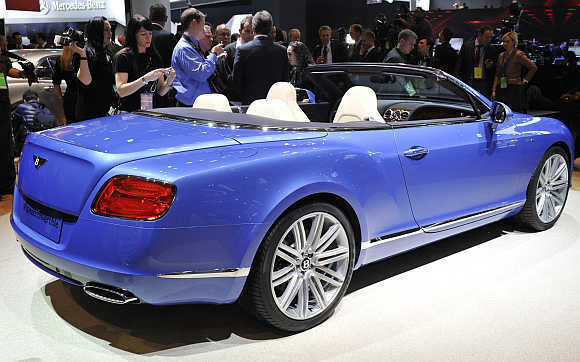 No contemporary high performance engine could match its combination of power, refinement and compact dimensions, and Bentley's engineering team has continued to refine and improve it with each successive generation. As a result, the W12 engine that powers today's Continental GT is even more powerful, refined, responsive and economical than its predecessors. The 575PS engine produces 700Nm of torque, giving that glorious surge of power at any engine speed that is a hallmark of Bentley performance. 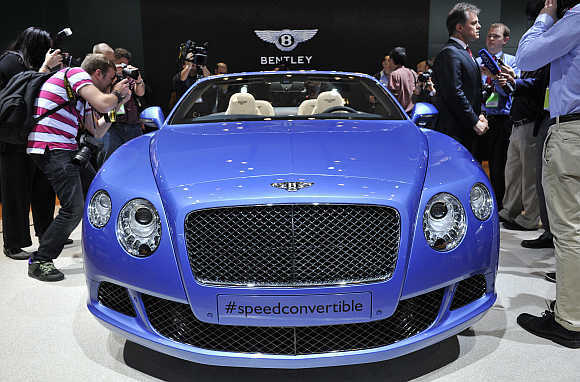 Image: The wrap comes off the Bentley Continental GT Speed Convertible as it is unveiled at the North American International Auto Show in Detroit, Michigan. Aston Martin has a rich heritage of craftsmanship; one-77 builds on this, seamlessly blending the highest calibre of contemporary engineering with the craft and beauty of the artisan's work. 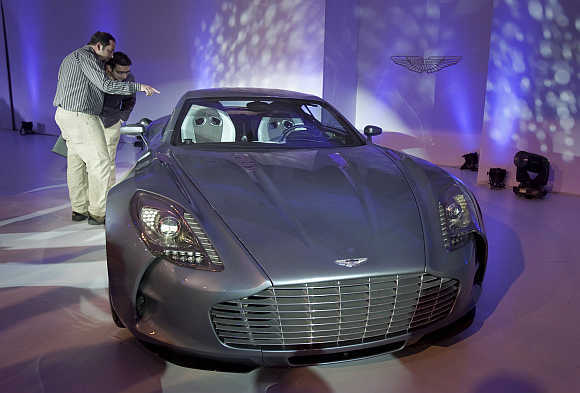 Image: Aston Martin One-77 is displayed in Mumbai. Aston Martin One-77 fuses advanced technology with stunning design to create possibly the world's most desirable automotive art form. 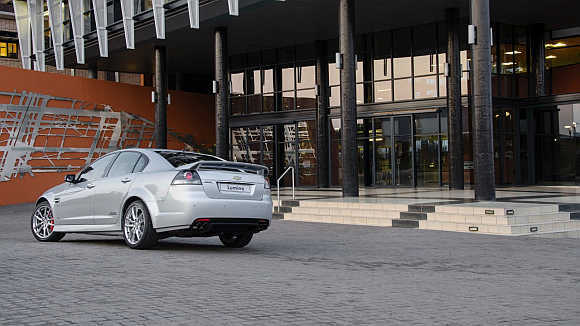 A powerful 6.0L V8 engine and advanced technology provide Chevy Lumina impressive performance in a stunning package. 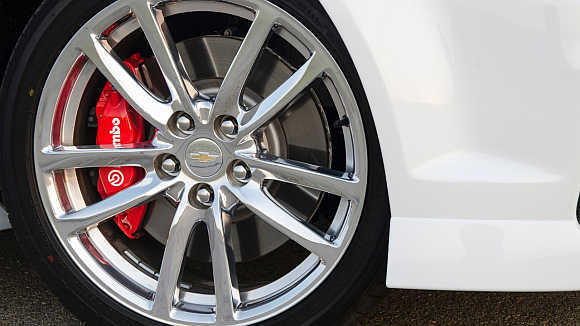 Safety and luxury features make Chevy Lumina a perfect choice for enthusiast, including police. 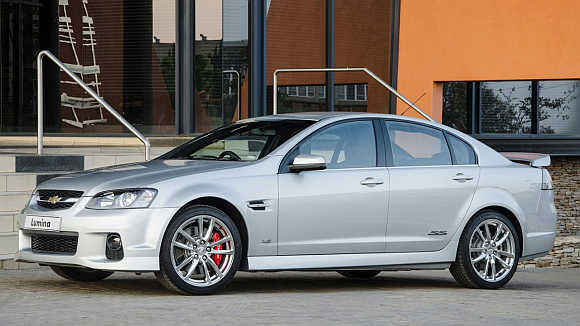 Although an impressive car, Chevy Lumina looks like a poor cousin in front of Aston Martin, Mercedes-Benz SLS AMG and Lamborghini Aventador.